Carte de visite (or a CDV-sized cabinet card) measuring 2.5 x 4.25 inches. Photographer is O. F. Weaver of Chicago, Illinois. Otherwise undated and unidentified. I’m never quite sure what to call these, with the heavier card stock and gold edges of a later cabinet card, but the size of a CDV. I think of CDVs as being a 19th Century product, but if that’s a wrist watch (and I’m not sure it is; maybe it’s just a bracelet), it would likely put her well into the 20th Century. Any thoughts on this would be welcome, since I have a good number of these. Regardless, I think it’s a strong image worth looking at. Those could totally be bracelets, not a wrist watch, it’s hard for me to tell. Interesting about wrist watches. I knew they existed earlier, I just wonder how popular they might have been that this girl would have been wearing one. I think gold borders on cabinet cards would have appeared around the mid-1880s at the earliest, though others are more expert at that than I am. If this image is earlier, then perhaps it’s a reproduction made a few years after the original image was taken? The photographer is Ormond F Weaver, born about 1840 in Michigan. He moved to Chicago about the mid 1860s as he is listed in the city directory of 1867 as a photographer and again in 1878, also a photographer.. In the 1880 census he is living in Beaver Dam, Wisconsin and his occupation is still, photographer. He lived there the rest of his life but is listed as an inmate at an insane asylum in 1905. As far as the young lady in the picture. She has an almost timeless air about her. The way she wears her hair, she could have easily been a young girl in the late 1960s, early 1970s, the only big give away is the clothing style. What I find interesting is what appears to be a charm necklace. 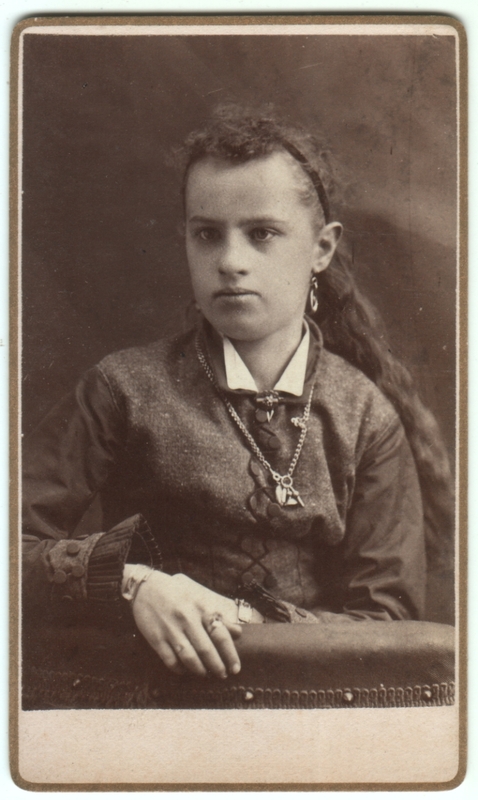 A lot of interesting jewelry for a picture that was taken as early as the late 1860s to 1870s. She really likes the accents; 2 bracelets, earrings, a charm necklace and two rings on her right hand. Quite an interesting subject. Thanks for sharing this one. Oh, that’s great! Thanks for the information. I did a quick search on the photographer and gave up too easily. It’s interesting, though, that the dates indicate the photo is likely earlier than the 1880s, mostly since the format of the card itself seems more recent, if only by a decade or so. It reinforces the notion that it might be a reproduction, but that doesn’t account for the pre-1880 address. I guess I’m still a little puzzled, but that’s okay, the photo is interesting enough as it is. I agree, from the neck up she could easily be from a century later. I’m guessing she piled on the jewelry for the photo, but perhaps she wore that much in daily life. I’m glad you like it! I like that your pictures inspire me to research where they might have come from. I did find another picture by the same photographer called “Mother Weaver” I think he might have been referring to his wife, Annie as he had not lived with his parents for quite some time. Well I’m glad you’re inspired to look things up, because you make a marvelous research assistant! 🙂 I actually enjoy doing that sort of detective work, but I haven’t paid for Ancestry.com yet, so I just do free stuff like Google for now. I’ll look into the paid sites at some point. I did see the “Mother Weaver” picture when I did my search. Your guess about his wife is a good one. re: “insane asylum.” OMG. Amazing research.